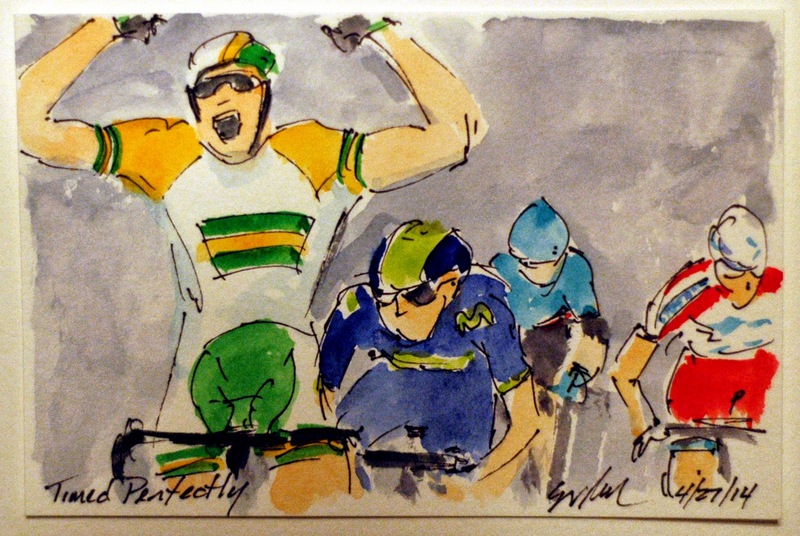 Simon Gerrans (Orica GreenEdge) and Australian National Champion, had the legs and the good fortune to be the one to raise his arms in a victorious celebration as victor of the 100th edition of Liege-Bastogne-Liege! Although you can't see him from this angle, Michal Kwiatkowski (OPQS) claimed third and Alejandro Valverde (Movistar) added a second place to his dramatic victory four days earlier at Fleche-Wallone. Alas, Dan Martin (Garmin Sharp), winner of the 99th running, while chasing down Caruso, had his rear wheel slide out from under him on the final corner within site of the finishing straight. Most likely, he would have added his second victory of this race in a row. I guess the luck of the Irish did not favor Dan today. This is an original watercolor and ink postcard that can be yours by visiting my artist website at www.greigleach.com. 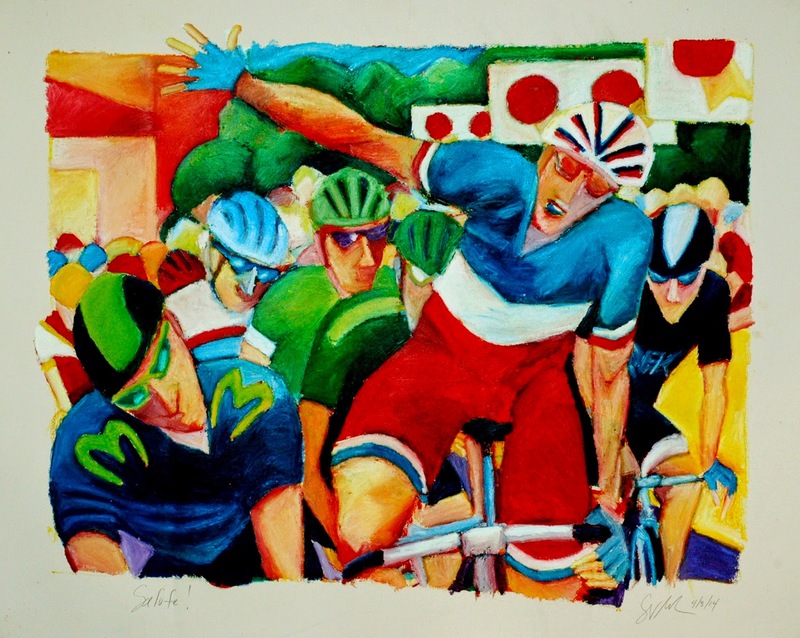 While you are there, why not browse around at all of the cycling art and other paintings on offer? For this particular painting, just follow the direct link at the end of this post. The Flame Rouge or the Red Kite, marks the final kilometer of the day's racing. Liege-Bastogne-Liege featured about a kilometer of climbing before the kite and kept going up after the leaders passed under its welcoming sight. Domenico Pozzovio (AG2R) and Giampaolo Caruso (Katusha), both climbers, got away on the final climb of the day and were doing well holding off the attacking peloton, although these two were within sight of the angry swarm of riders who each nursed hopes of claiming the victory at the line. 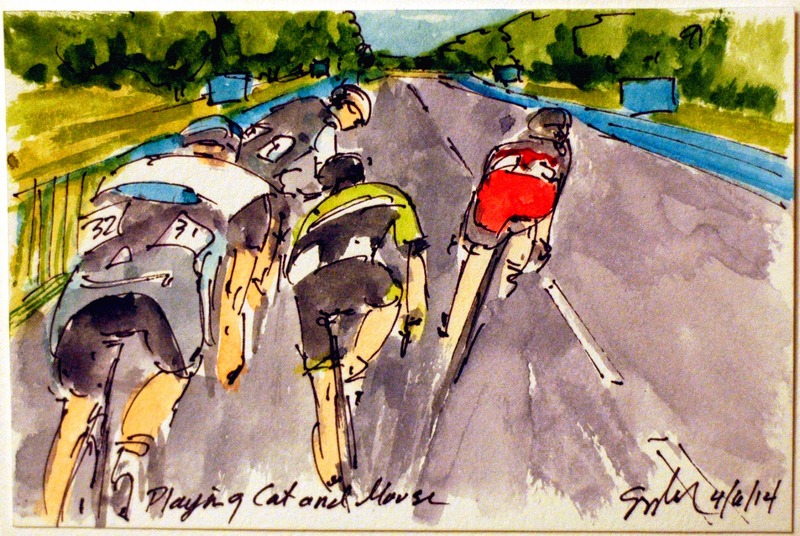 This is an original watercolor and ink postcard that could be yours by visiting my artist website at www.greigleach.com or you could just follow the direct link at the end of this post to get your piece of art of the 100th edition of this final of the Spring Classics. Now that the peloton had pulled back the early break, wheeled back in Alex Howes (Garmin Sharp) the attacks started coming fast and furious. This time it was Vincenzo Niblai (Astana & the 2013 winner of the Giro d'Italia) who jumped away with a couple of riders, and then attacked again. Only to be matched in the effort by Cyril Gautier (Europcar) and Lars Petter Nordhaug (Belkin Pro Cycling). Moments later, it was Lars' turn to have a go in search of the two tiny climbers who had escaped on the final recognized climb of the day. 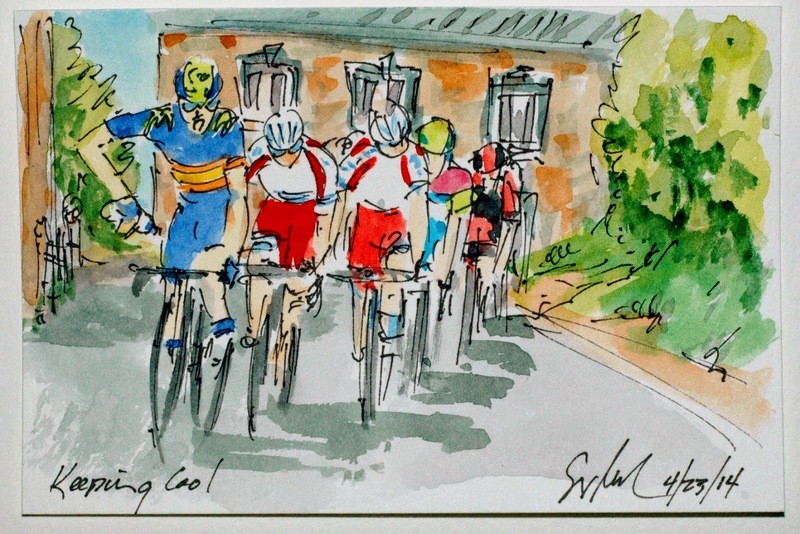 This group was running out of real estate with just 5 kilometers left until the line in Liege. This is an original watercolor and ink postcard that could be yours by visiting my artist website at www.greigleach.com or you could just follow the direct link at the end of this post. With just one categorized climb to go, the last remaining member of the early break away, Matteo Bono (Lampre-Merida) check over his shoulder encase he could see just how close the peloton actually was. While it was inevitable that he would eventually be caught, he spent 241 kilometers out in front of every member of the peloton that rolled out in Liege under the waving start flag of the King of Belgium. Every once in a while, the break succeeds and the upset win is accomplished. Just not today. This is an original watercolor and ink postcard that could be yours by visiting my artist website at www.greigleach.com. 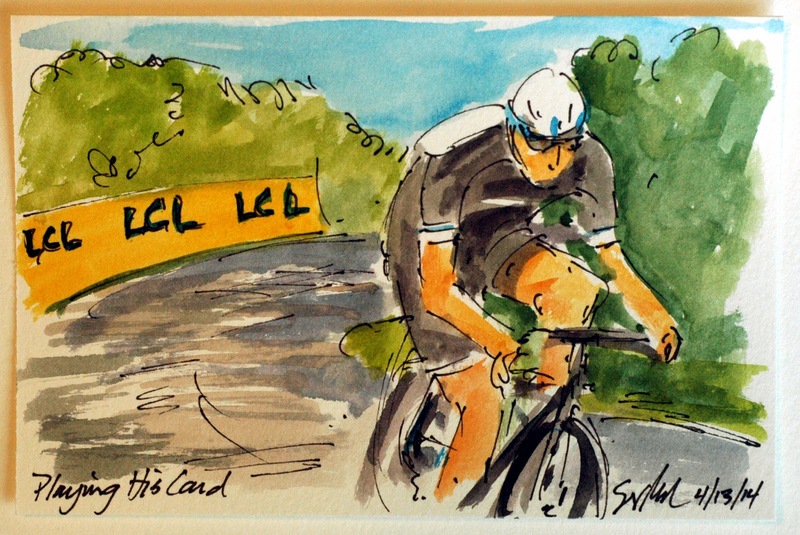 Or you could just follow the direct link at the end of this post to get your piece of art of the 100th Liege-Bastogne-Liege. 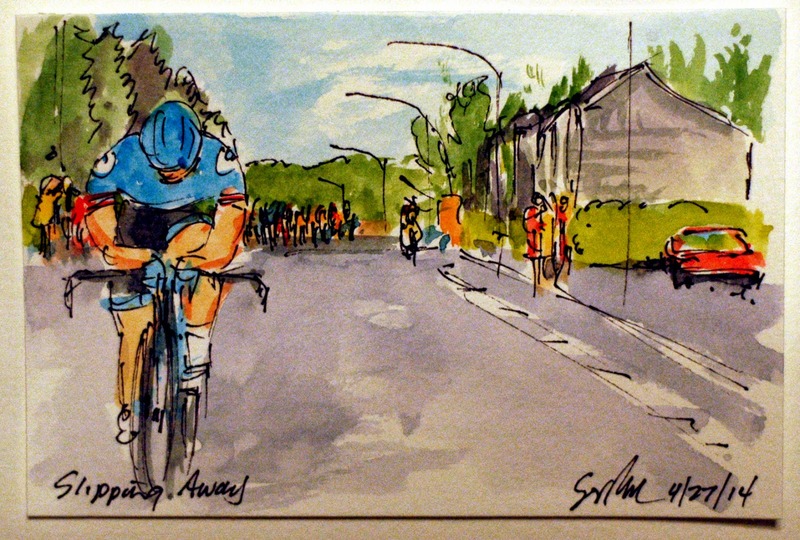 Garmin Sharp came to Liege-Bastogne-Liege with a strong team and the winner from 2013, Dan Martin. That left them with a lot of different cards to play, and they seemed ready to play everyone. Once the peloton was within a minute of the remnants of the early break, the American, Alex Howes, was able to get a respectable gap from the peloton. They may have been to busy marking each other to take any notice of Howes, although it wasn't long before a few other opportunist jumped from the pack to give him some company and some help. This is an original watercolor and ink postcard that could be yours by visiting my artist website at www.greigleach.com. 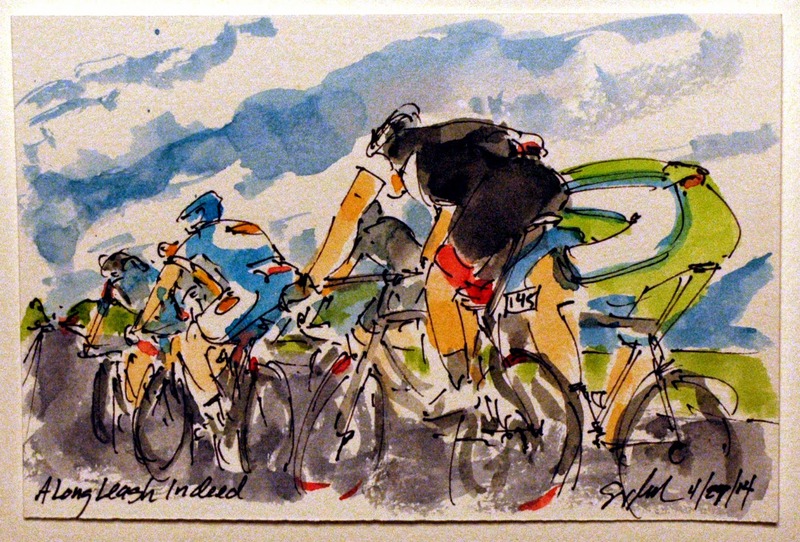 Or you could just follow the direct link at the end of this post to get your piece of the 100th Liege-Bastogne-Liege. With the steep climbs and hundreds of kilometers in the 100th Liege-Bastogne-Liege the break away group kept losing members every time they went up another climb. So with about another 50 K to go to was down to just Jacobus Venter (MTN-Qhubeka) and Matteo Bono (Lampre-Merida) still holding off the peloton with about 4 or 5 minutes to spare. Remember at this point these two have been out in front for over 200 kilometers. This is an original watercolor and ink postcard that is available for purchase at my artist website, www.greigleach.com. 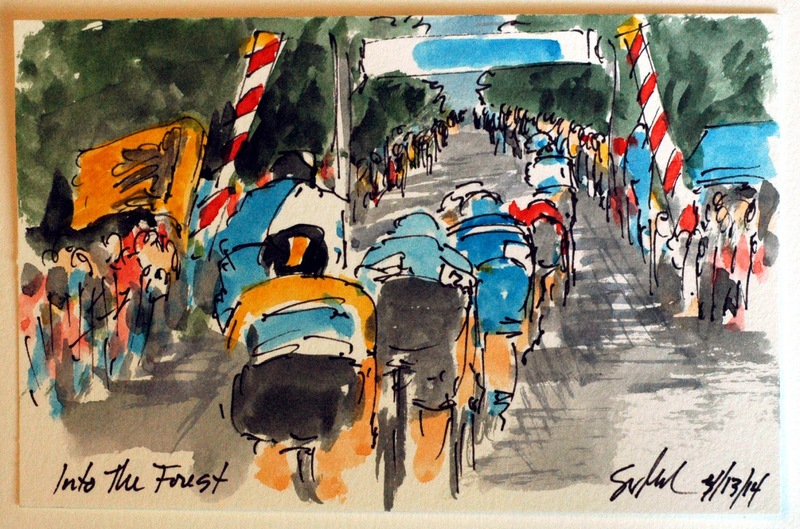 Or you could just follow the direct link at the end of this post to get your piece of the 100th edition of the final of the Spring Classics. Every climb along the entire 263 kilometers of the 100th running of Liege-Bastogne-Liege are lined with thousands of screaming cycling fans (and a number of Belgium beer enthusiasts). 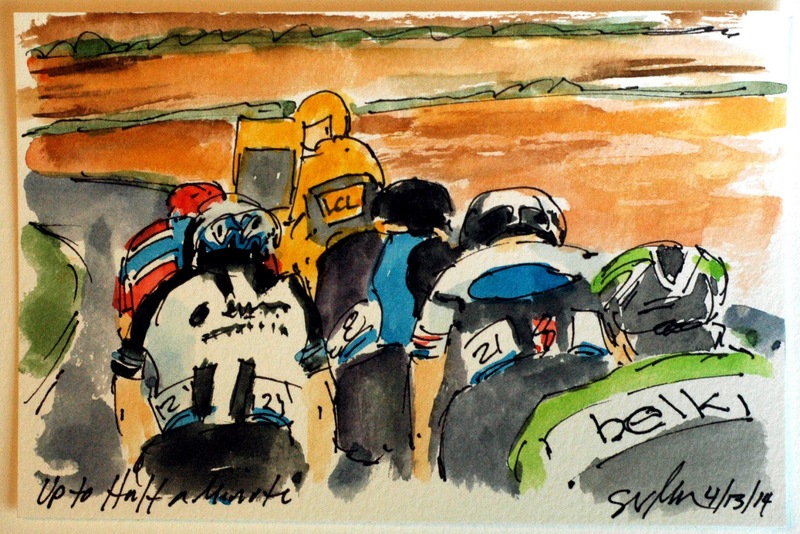 This is the view from the back of the peloton, where the suffering is happening. 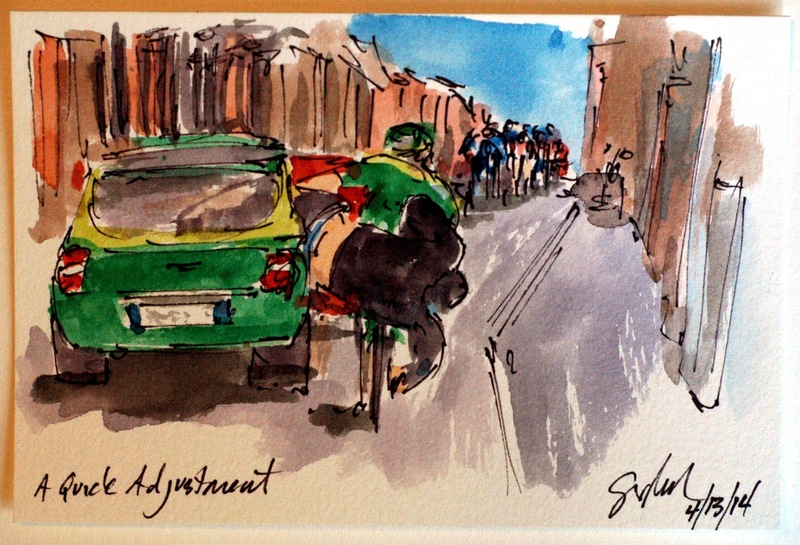 Either because the kilometers are getting into the legs, or the riders have had a mechanical, a nature break, or some other reason that they are at the back trying to work their way back up to the business end of the peloton. Here it is Pieter Velits (BMC) who has done a lot of the work bringing back the break away and Thomas Damseau (Giant-Shimano) climbing under the waving Belgium flag. This is an original watercolor and ink postcard that could be yours by visiting my artist website at www.greigleach.com or you could just follow the direct link at the end of this post. With over 150 kilometers raced and another 90 to go, it seemed a bit early for one of the favorites to put in an attack. But that is just what Omega Pharma Quickstep and the Polish National Champion, Michal Kwiatkowski did. Or it could have just been a little psychological ploy to show the rest that Michal was feeling strong and confident. And not without just cause, he has been having an excellent early half of the season. This is an original watercolor and ink postcard that could be yours by visiting my artist website at www.greigleach.com. 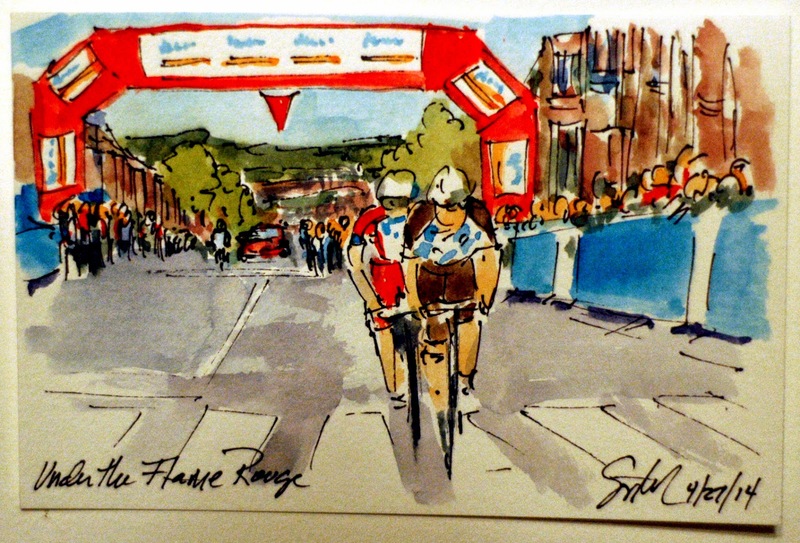 Or to get this particular piece of the 100th edition of Liege-Bastogne-Liege just follow the direct link at the end of this post. 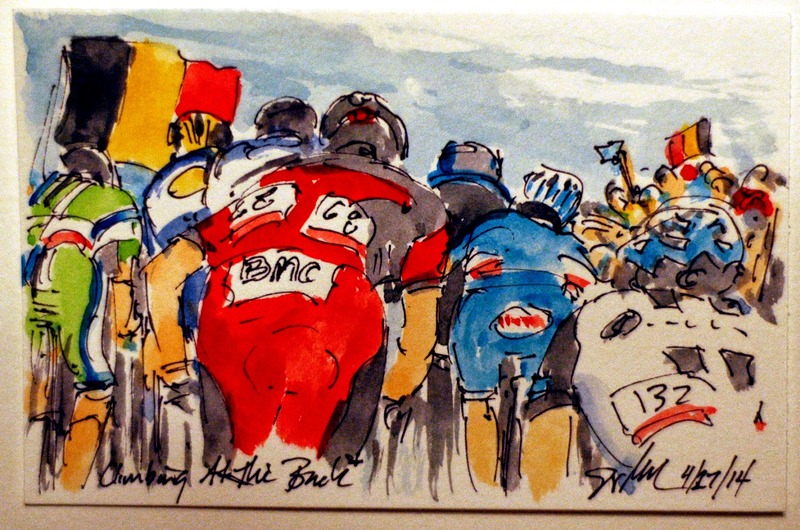 Liege-Bastogne-Liege: Just How Far Ahead? With the breakaway of six riders so far up the road, and the chalkboard keeping the peloton informed on the size of the gap, it was up to the teams of the contenders to set about the task of pulling back the nearly 16 minutes the escapees had on the peloton. 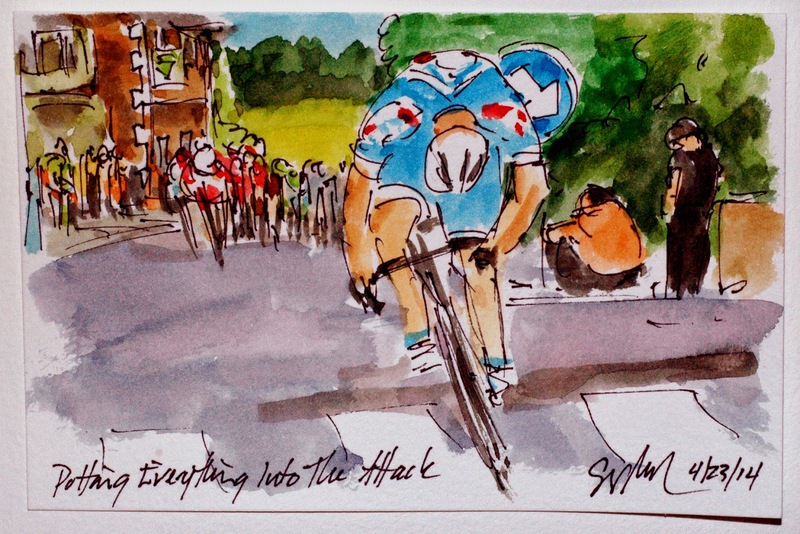 With Movistar, Garmin Sharp, BMC and Lotto-Belisol having missed the break, it was up to them to put a man each on the front to do the work at hand. This is an original watercolor and ink postcard that could be yours by visiting my artist website at www.greigleach.com. 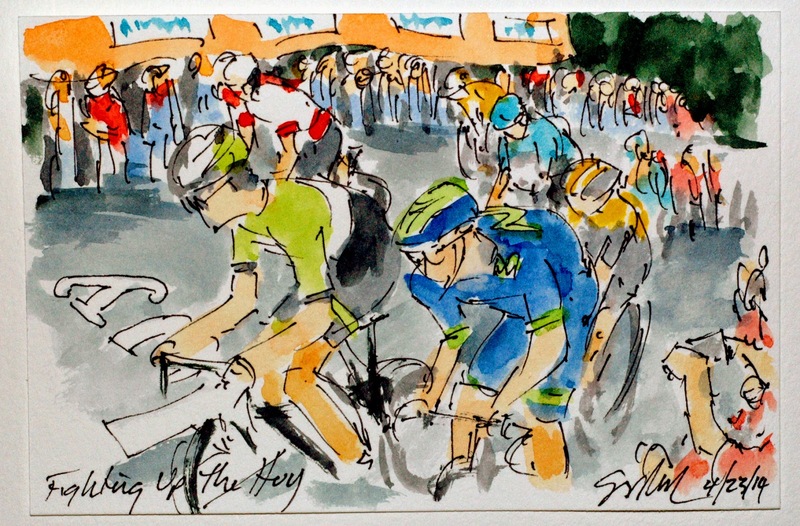 Or if you want your very own piece of the 100th edition of this fabled Spring Classic just follow the direct link at the end of this post. The peloton set off on the 100th edition of Liege-Bastogne-Liege, the last of the Spring Classics facing 263 kilometers of the roads of Belgium and the short steep climbs of the Ardenne. With so many kilometers to race, the peloton let this group of six build up a very big lead of almost 16 minutes, before the teams that didn't make the break decided that enough was enough. The break was comprised of wild cards and Pro Tour teams and included, Pirim Lang (IAM Cycling), Michel Koch (Cannondale), Pieter Jacobs (Topsport-Vlaanderen), Jacobus Venter (MTN-Qhubeka), Matteo Bono (Lampre-Merida) and Mario Minnaard (Wanty-Groupe Gobert) as they road along the wide open skies and fields of the countryside. This is an original watercolor and ink postcard that was created using Yarka St. Petersburg Watercolors and Steve Quiller brushes from www.richesonart.com. In addition this work is available for purchase through my artist website at www.greigleach.com. Or for this particular painting you could just follow the direct link at the end of this list. Alejandro Valverde (Movistar) was wise enough to take one last look over his shoulder, making sure that no one was going to catch him, before he threw his arms in the air celebrating his victory in Fleche Wallone. He timed his surge just right getting around the fading Dan Martin (Garmin Sharp) who claimed second, Bauke Mollema (Belkin Pro Cycling) and Michal Kwiatkowski (OPQS) who finished out the podium in third place. It was a great way to pay back the hard work put in by the Spanish National Champion, Herrada (Movistar). This is an original watercolor and ink postcard that can be yours by visiting my artist website at www.greigleach.com or you could just follow the direct link at the end of this post. Fleche Wallone ends after 199 kilometers with a one and a half kilometer climb up a wall called the Mur du Huy (or the Murder) that has 19 percent gradient sections with an average of 11 percent. The finish line is at the top of the third time up this climb so it is here that the race is won or lost. Part of the challenge is waiting long enough to put in your attack, go too soon and you will burst before the top, wait too long and you will run out of real estate before you reach the finish. This is the point of absolute effort by Bauke Mollema (Belkin Pro Cycling), Alejandro Valverde (Movistar), Michal Kwiatkowski (OPQS), Dan Martin (Garmin Sharp) and Romain Kreuziger (Tinkoff-Saxo), with less than 500 meters to the line. This is an original watercolor and ink postcard that can be yours by visiting my artist website at www.greigleach.com or you could just follow the direct link at the end of this post. Katusha pulled Rolland and Bakelants back into the peloton and then it was Jeremy Roy (FDJ) who went out on the attack on the penultimate climb of the day. 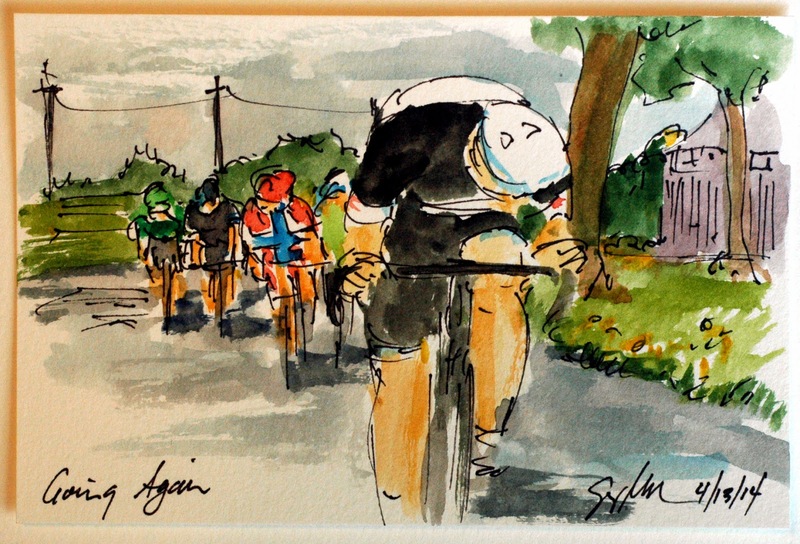 He knew that he didn't have the strength to wait for the final climb up the famed Mur du Huy so he laid it all out in an effort to get to that climb alone. This is an original watercolor and ink postcard that can be yours by visiting my artist website at www.greigleach.com or you could just follow the direct link at the end of this post. 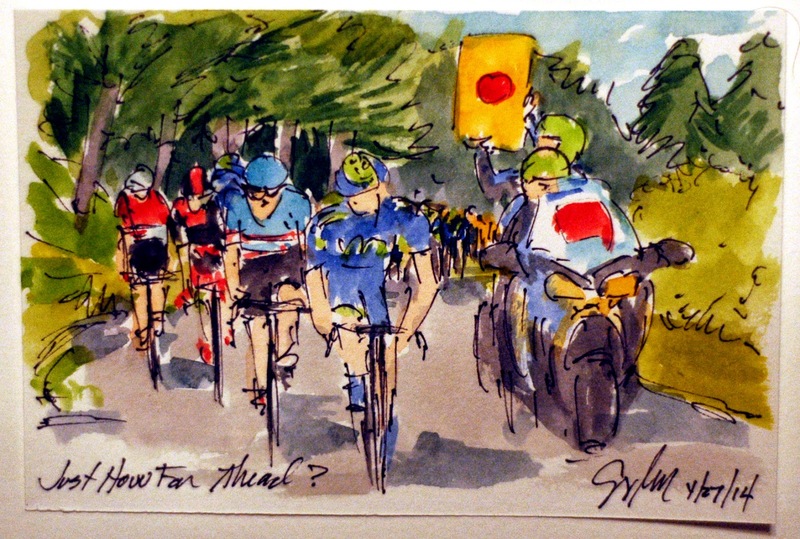 Fleche Wallone: Do I Have a Gap? 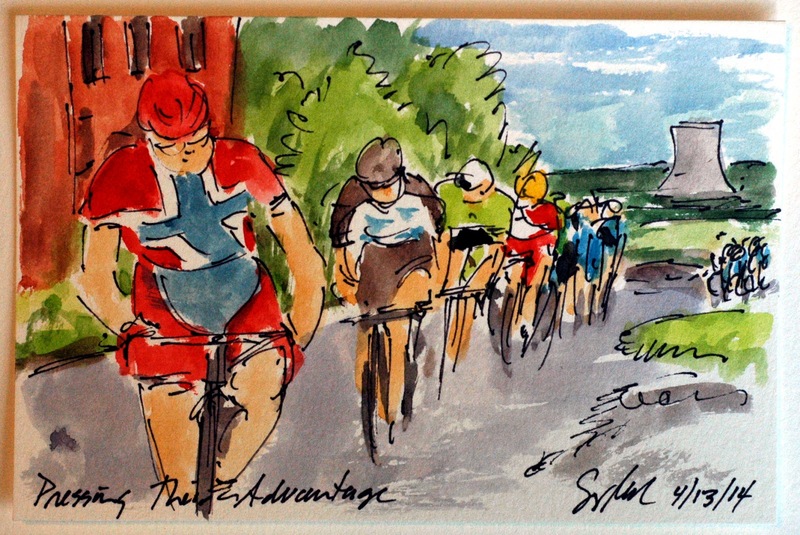 Once the peloton had caught the early break of the day, it was time for the counter moves and opportunist to make their attempts at stealing the race from the favorites. 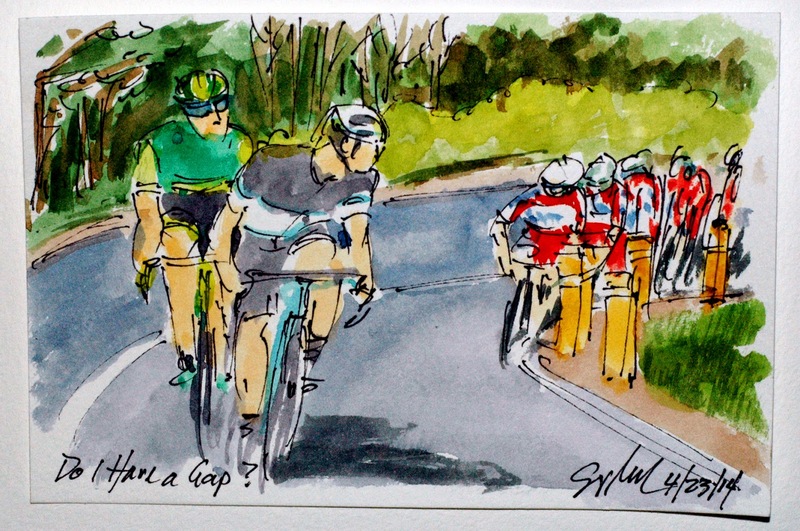 Here the first hard attack comes from Jan Bakelants (OPQS) and Pierre Rolland (Europcar), with Bakelants looking back around the corner to see what kind of gap he was able to get from the Katusha led peloton. This is an original watercolor and ink postcard that can be yours by visiting my artist website at www.greigleach.com or you could just follow the direct link at the end of this post. Jesus Herrada (Movistar - Spanish National Champion) played his part of Movistar's plan for the day helping Katusha set the pace and slowly reel pack in the break away up the road. While it wasn't exactly hot on the road (although much warmer that previous editions that have been raced in the snow), Herrada still used his water bottle to spray himself down in an effort to keep cool. Katusha assisted in the chase, having the winners of the last two Fleche Wallones in their roster of riders on the day. Of course Herrada's teammate, Valverde has one victory here on his Palmares as well. This is an original ink and watercolor postcard that could be yours by visiting my artist website at www.greigleach.com or you could just follow the direct link at the end of this post. 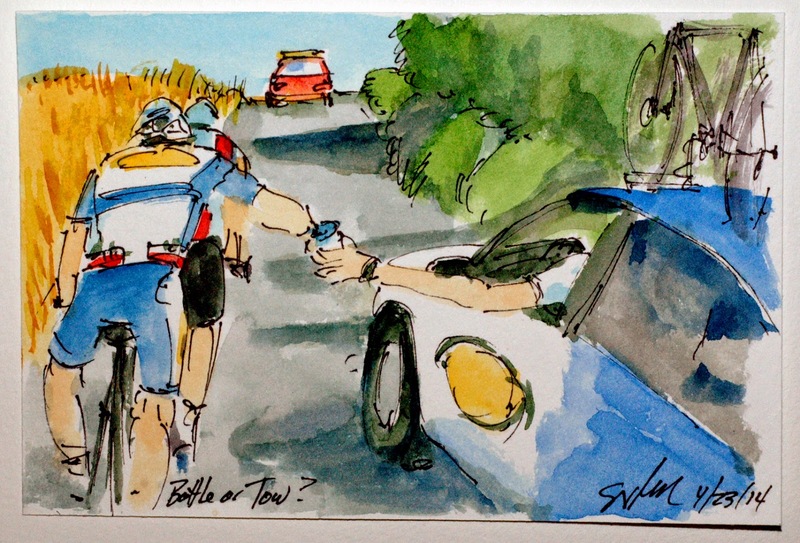 Fleche Wallone: Bottle or Tow? Given the pace of the day, Jonathan Clarke (United Healthcare) couldn't hang with these two in the early break, Ramunas Navadauskas (Garmin Sharp) and Preben Van Hecke (Topsport Vlaanderen). As they started up another of the seemingly uncountable hills Van Hecke's team car came up to pass a bottle and maybe to give a little tow up the climb. The nice touch was that shortly after this moment, the Director Sprotif passed a bottle to Navadauskas even though he was on a competing team. However, when riders are in a break together, they are at least temporarily teammates in trying to hold off the peloton. This is an original watercolor and ink postcard that is available from my artist website at www.greigleach.com or you could just follow the direct link at the end of this post. 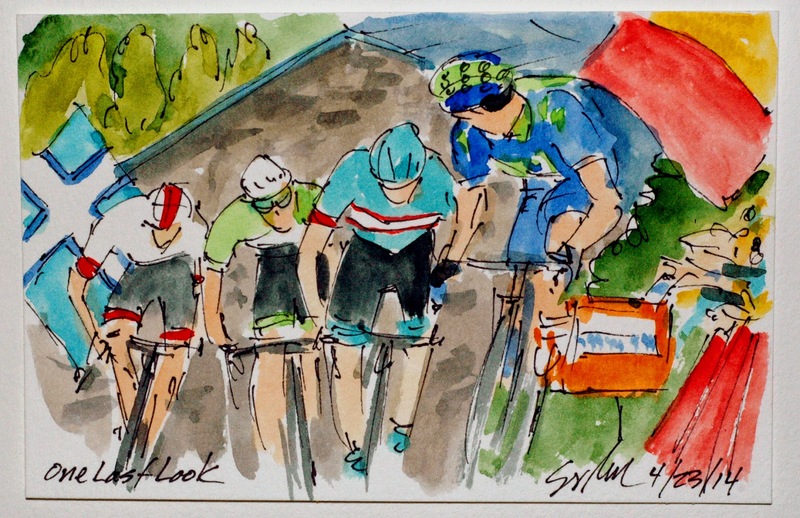 This running of the Fleche Wallone, another of the Spring Monuments, started with a small three man break away comprised of one Pro Tour Team and two of the Wild Card invitational teams. They were represented by Jonathan Clarke (United Healthcare), Preben Van Hecke (Topsport-Vlaanderen) and Ramunas Navadauskas (Garmin Sharp). 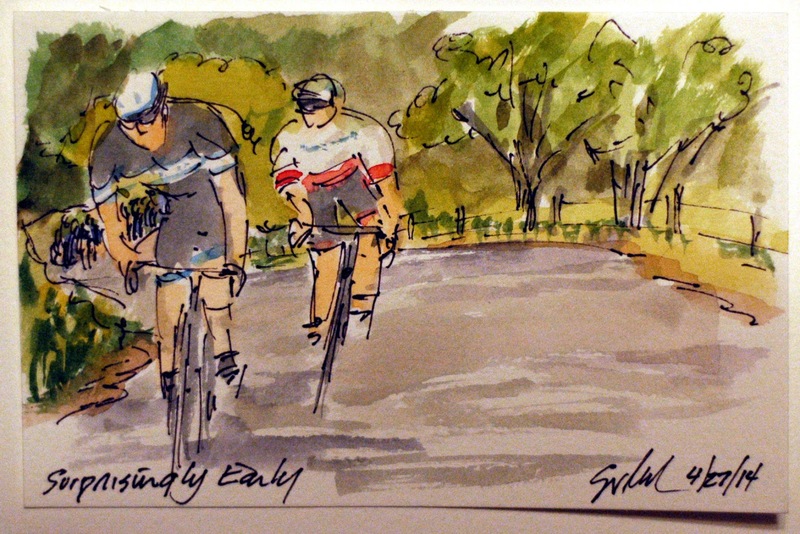 They built up a seven minute lead on the peloton, but then there was still a lot of short steep climbs ahead of them. So the peloton knew that they would be relatively easy to pull back into the fold. 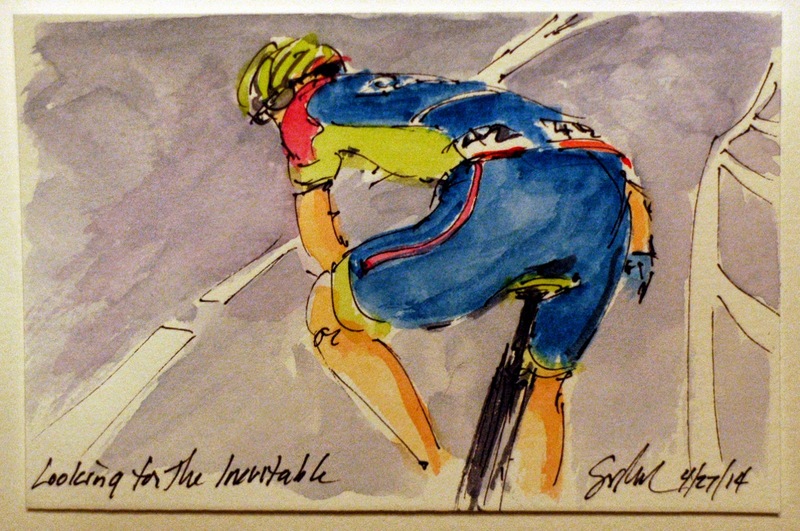 This is an original watercolor and ink postcard that was created using watercolors and brushes from www.richesonart.com This painting and all of my cycling artwork can be yours by visiting my artist website at www.greigleach.com For this particular painting you can follow the direct link at the end of this post. 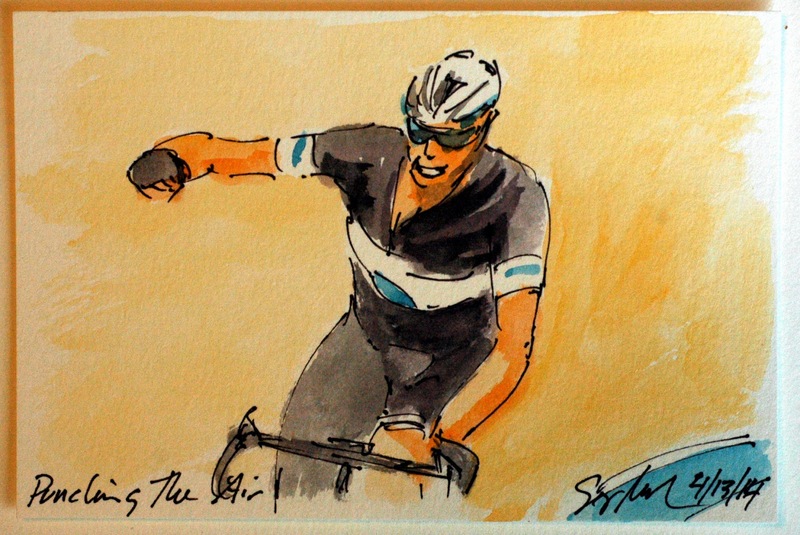 Omega Pharma Quickstep had the perfect set up for the day with three teammates in the final break of the day. First it was Tom Boonen going on the attack and softening up the other teams. He even succeeded in isolating last year's winner, Fabian Cancellara (Trek Factory Racing). Once the vastly reduced peloton joined all of the attackers, OPQS was able to send another guy off on his own. However this one stuck for Niki Terpstra as he left the group with around 3 kilometers left to ride. He got such a gap that he was able to ride into the velodrome that marks the final 750 meters of the race on his own. And so much time that he spent the finishing straight celebrating his victory that had eluded him on previous attempts. The podium was completed in a bunch sprint with John Dekenkolb (Giant Shimano) claiming second just out sprinting Fabian Cancellara (Trek Factory Racing) who had to settle for third. Oddly, Peter Sagan, could only manage a sixth place (5th amongst the sprinting group). This is an original watercolor and ink postcard that is available through my artist website at www.greigleach.com or you could just follow the direct link at the end of this post. 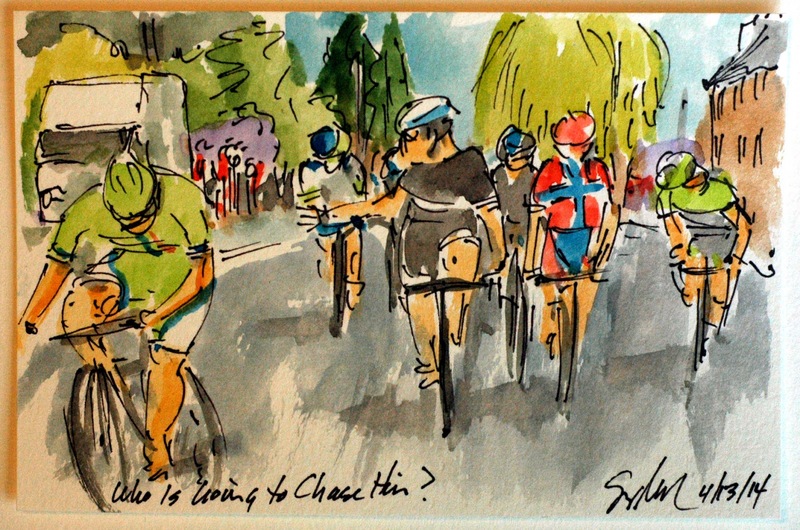 Paris Roubaix: Who Is Going to Chase Him? After Boonen (OPQS) had bridged up to the break and later attack that group, it was the sprinter Peter Sagan (Team Cannondale) that set off from the peloton to join up with the group up the road. Once they had all reeled Boonen back in it was Sagan's turn to go for the solo attack hoping to catch them all napping. He attacked just as the group caught Boonen, slowed and started looking at each other to see who had anything left. This is an original watercolor and ink postcard that is available through my artist website at www.greigleach.com or you could just follow the direct link at the end of this post. Tom Boonen (OPQS) was quite entertaining in the break trying to get everyone to ride hard, however none wanted to carry him to the finish. There was quite a bit of angry gesturing going on before he put that anger into the pedals and road them all off of his wheel on the third to last section of pave. He came to this race with a mission and wasn't going to let a bunch of passengers slow him down. This is an original watercolor and ink postcard that can be yours by visiting my artist website at www.greigleach.com or you could just follow the direct link at the end of this post. A holdover from the days before race radios the race organization provides a motorcycle with a chalkboard who will ride between each group on the road showing them the time gaps. This is so low tech that it is done with a stop watch and written with chalk on a traditional chalkboard. Some races have gone to the dry erase board which will work a little better in the rain. This is the break with Thor Hushovd (BMC), Simon Geraints (Sky) and now with Tom Boonen (OPQS) who have the power to stay away to the finish. This is an original watercolor and ink postcard that is available for purchase through my artist website, www.greigleach.com or you could just follow the direct link at the end of this post. Once Tom Boonen (OPQS) had seen that Thor Hushovd (BMC), Geraint Thomas (Team Sky) and others were in a strong break away up the road, he jumped out of the peloton on one of the harder cobbled sections and powered his way up the road on his own. Boonen has won this race four times in his career and he was eager to be the first to claimed the Cobble Trophy for a record setting fifth time. This is an original watercolor and ink postcard that can be yours by visiting my artist website at www.greigleach.com or you could just follow the direct link at the end of this post. Once the early break had been caught, it was time for the contenders and pretenders to have a go at getting away from the fast moving peloton. The average speed of the 260 kilometer stage was roughly 45 kilometers per hour, so it took a great deal of effort for Thor Hushovd (BMC) in his Norwegian Champion Jersey and company to get away and form the second eight rider break of the day. Behind this group, Tom Boonen (OPQS) realized that he wanted in with a strong man like Thor. 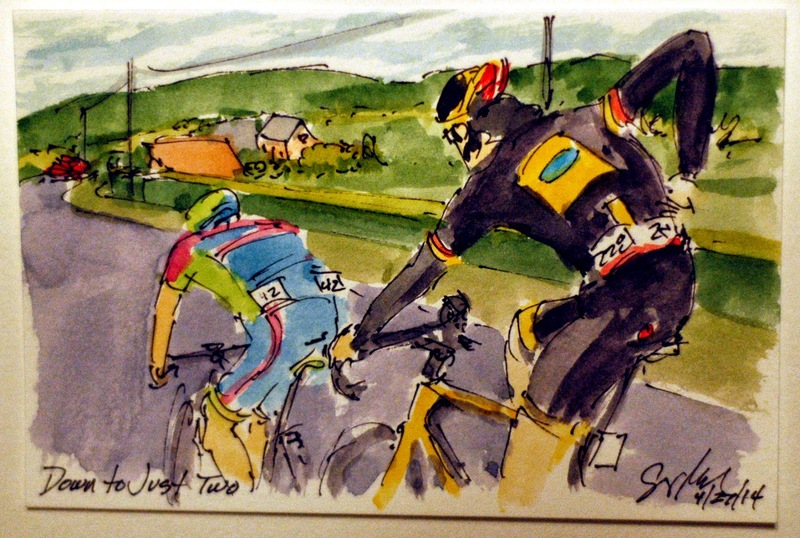 Both riders are former wearers of the Rainbow Jersey of World Road Race Champion, both wearing the rainbow stripes on the sleeves of their team kit. This is an original watercolor and ink postcard that can be yours by visiting my artist website at www.greigleach.com or you could just follow the direct link at the end of this post. Paris Roubaix throws a lot of obstacles at the competitors from strong winds, to cobbled roads and even railroad crossings. While they race on closed roads, meaning no cars or traffic, the fabulous train system of Europe keeps running and occasionally will catch a rider out. 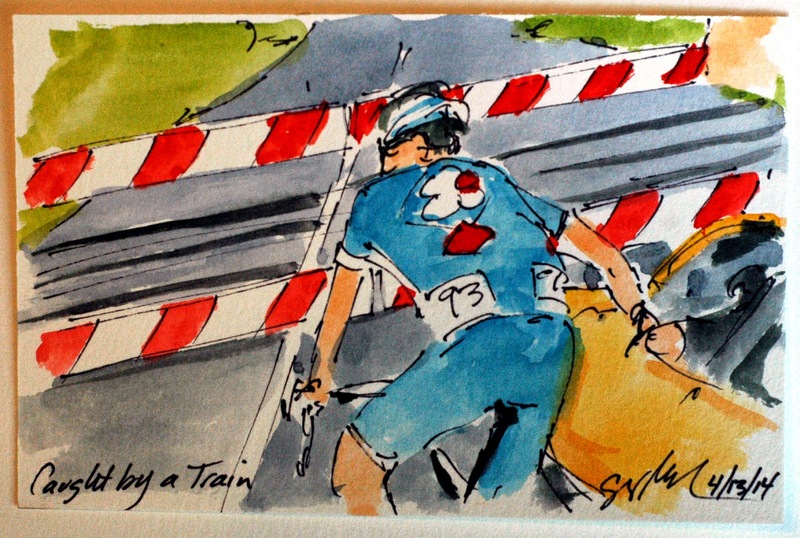 Here it is David Boucher (FDJ) having had a flat while in the break, gets caught by a high speed train (although not fast enough for his needs). It was several years ago that a break away including George Hincapie was waved through a closed gate only to be disqualified for crossing the tracks. While it caused a controversy (it was a police officer who waved them through) it was the right thing to do for the safety of all involved. So here Boucher sits leaning against the neutral service car while the break speeds a way and the peloton gets closer and closer. This is an original watercolor and ink postcard that is available through my artist website at www.greigleach.com or you could just follow the direct link at the end of this post. With the 28 cobbles to be conquered probably the most famous (and most difficult) is the stretch that goes straight through the famed Forest of Arenberg. Like most of the cobbled sections of Paris Roubaix the stretch of road is only open to traffic once a year, and that one time is for this, the Hell of the North. This is the eight riders of the early break mainly representing the Wild Card Teams of Bretagne-Seche Environnment, Net App-Endura, Topsport, and United Healthcare, although Lotto-Belisol and Tinkoff Saxo did make the break as well. This is an original watercolor and ink postcard that is available through my artist website at www.greigleach.com or you could just follow the direct link at the end of this post. The roads of Paris Roubaix include 28 sections of cobblestones, but most are also very narrow, making it hard to move up towards the front of the peloton. This makes gaining and holding your position very important. Team Sky has shown itself to be very adapt at controlling things at the front of a race and at times were up to the task at hand. 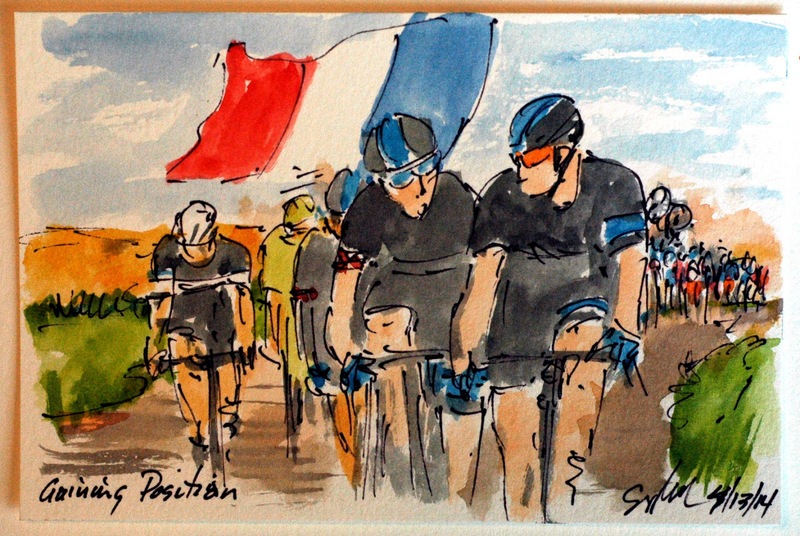 Here it is Christian Knees, Simon Geraints and Sir Bradley Wiggins holding the position in the strong cross winds of northern France. This is an original watercolor and ink postcard that could be yours by being the first to visit my artist website at www.greigleach.com or you could just follow the direct link at the end of this post. These original works are only $50 USD including shipping. Paris Roubaix is a hard race on everyone including the mechanics. I think this is the winner of the "how far out of the car can you reach before you bounce off of the road" prize. Jimmy Engoulvent (Europcar) had trouble with his derailleur, with the chain jumping off of the rear cog, it fell to the mechanic to make the adjustments and lube the chain all at 45 kph. The dust of the cobbles of the Hell of the North, play havoc on these fine tuned racing machines not to mention the damage the pounding of the rough roads do to rider and bike alike. 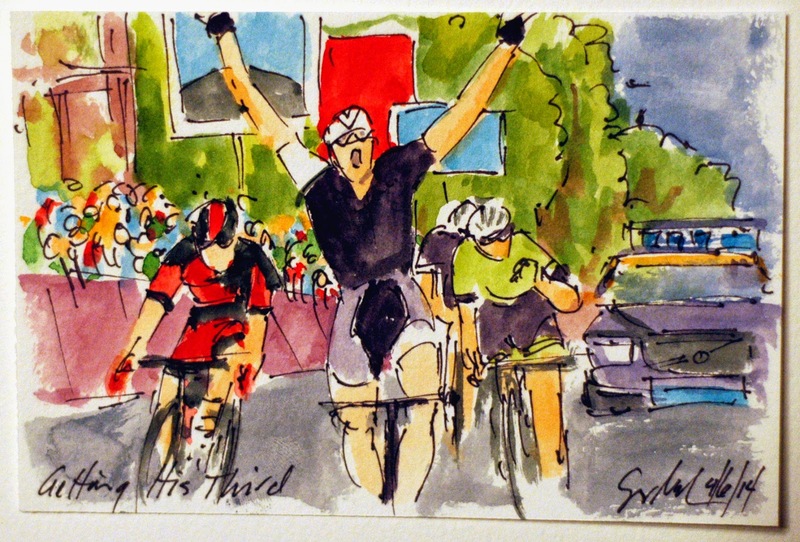 This is an original watercolor and ink postcard that was created using Yarka St. Petersburg watercolors and Steve Quiller brushes from www.richesonart.com Also, this painting and all of my cycling art is available for purchase through my artist website for only $50.00 (USD). You can follow the direct link at the end of this post for this particular piece. And the winner of the game of cat and mouse... Fabian Cancellara (Trek Factory Racing) claimed his third victory, and the second in a row, of the Tour of Flanders, nipping Greg Van Avermaet (BMC) at the line, with Sep Vanmarcke (Belkin Pro Cycling) punching the air in frustration as he takes third ahead of Stijn Vandenbergh (Omega Pharma Quickstep). This is an original watercolor and ink postcard that can be yours by visiting my artist website at www.greigleach.com, or you could follow the direct link at the end of this post. With everyone else too far back to catch these four leaders as they slid under the one kilometer to go banner, it was time to figure out how to beat each other to the line. 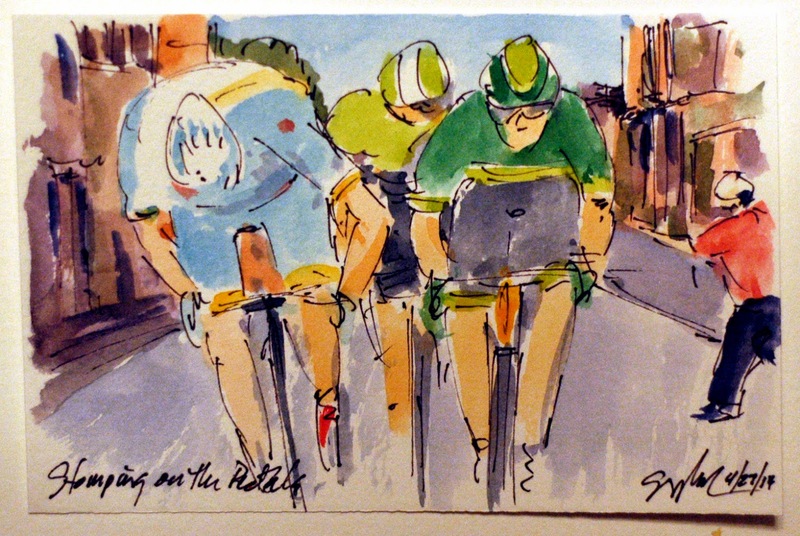 So they started feigning attacks, swinging to the opposite sides of the road, and watching each other for the tell tale signs of the start of a sprint for the finish. No one wanted to be the first to go and they all wanted to be the last bike in the group (the easy place to start a surprise attack from). At this point it is Fabian Cancellara (Trek Factory Racing) on the front, looking over his shoulder in fear of the surprise turn of a pedal in anger. This is an original watercolor and ink postcard that could be yours by being the first to visited my artist website at www.greigleach.com Or you could just follow the direct link at the end of this post. Fabian Cancellara (Trek Factory Racing) has targeted the cobbled and fabled Spring Classics on his race calendar with the intention of claim victory in them all. He has started in great form and was ready to race today as he attacked the other favorites on the penultimate climb of the day. He simply increased his cadence riding everyone except Sep Vanmarcke (Belkin Pro Cycling) off of his wheel on the steepest section of the climb as he went off in search of the two riders up the road. This is an original watercolor and ink postcard that could be yours by being the first to visit my artist website at www.greigleach.com. Or you could just follow the direct link at the end of this post. Once Van Avermaet and a couple of others had gone up the road, it was up to the favorites to chase them down. 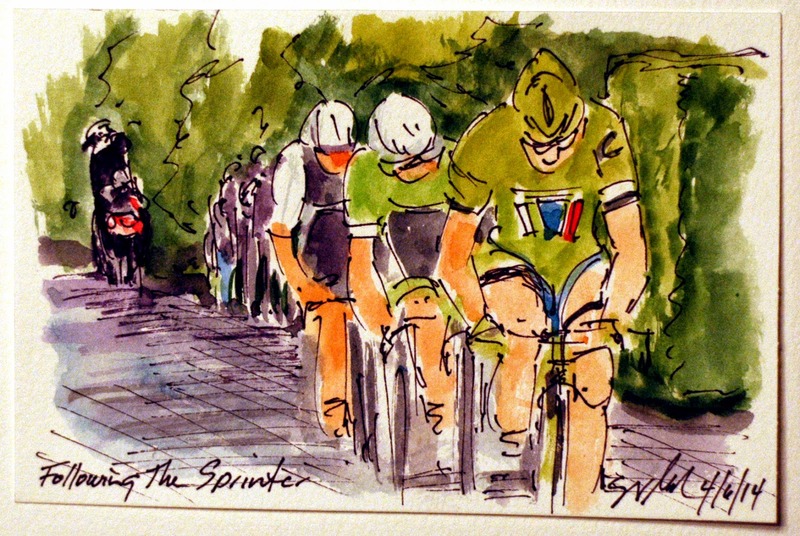 However no one was willing to carry Peter Sagan (Team Cannondale) along with them to the line, none feeling they were strong enough to outsprint the winner of the Sprinter's Green Jersey of last year's Tour de France. 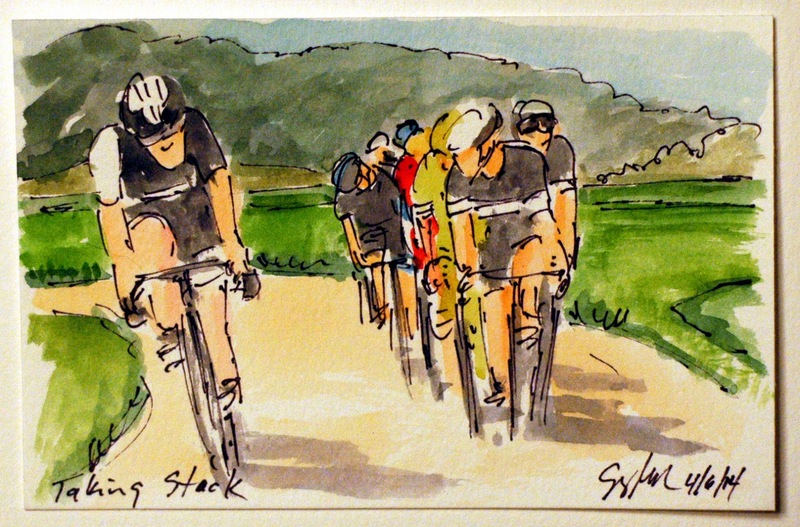 So while Omega Pharma Quickstep had four teammates in the group, they along with Belkin and Trek Factory Racing left it to Sagan to pull the attackers back. Tuck in to the slip stream of the Slovak are Sep Vanmarcke (Belkin Pro Cycling) and Fabian Cancellara (Trek Factory Racing - and last year's winner). This is an original watercolor and ink postcard that is available for purchase at my artist website, www.greigleach.com. You can just follow the direct link at the end of this post. With the big named favorites all looking at each other, it was an opportunity for the opportunists and the un-marked men to take a storm up the road. Greg Van Avermaet (BMC) was the first to use one of the steep cobbled climbs to wage an attack against the whittled down peloton. He had Sebastien Minard (AG2R) did his best to go with the attacking German, but just couldn't hold his wheel on the ascent. This is an original watercolor and ink postcard that could be yours by being the first to visit my artist website at www.greigleach.com or you could just follow the direct link at the end of this post. 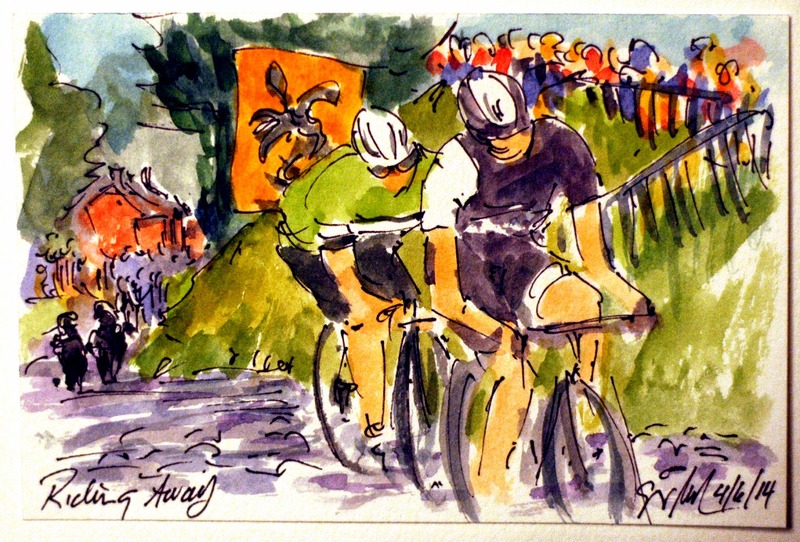 The Tour of Flanders is another of the big hard cobbled races that make up the Spring Classics calendar where the big men of Belguim, the Dutch and the Norwegians come out to play, although this painting includes the Swiss Spartacus (Fabian Cancellara - Trek Factory Racing) and the Slovak sprinter, Peter Sagan (Team Cannondale). 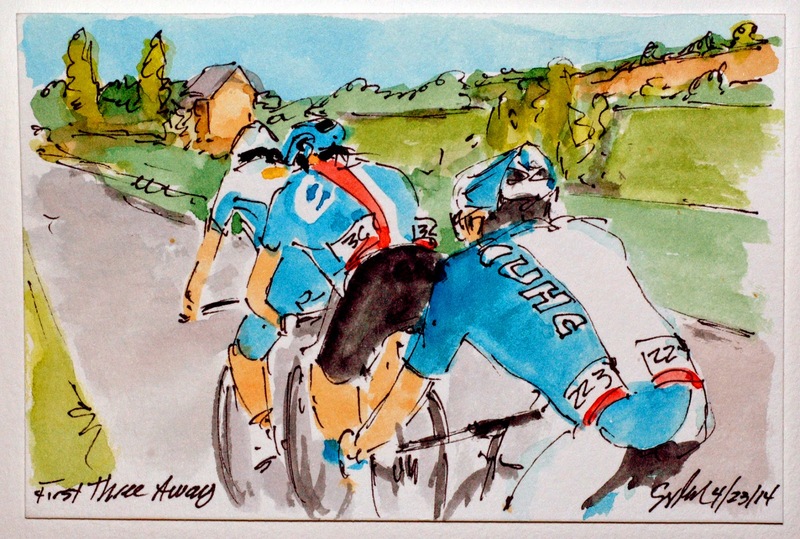 After the early breakaway was caught by the peloton, the favorites for the day's race went on the attack on the first short steep climb of the Patenberg, as they began to play their cards for the victory. 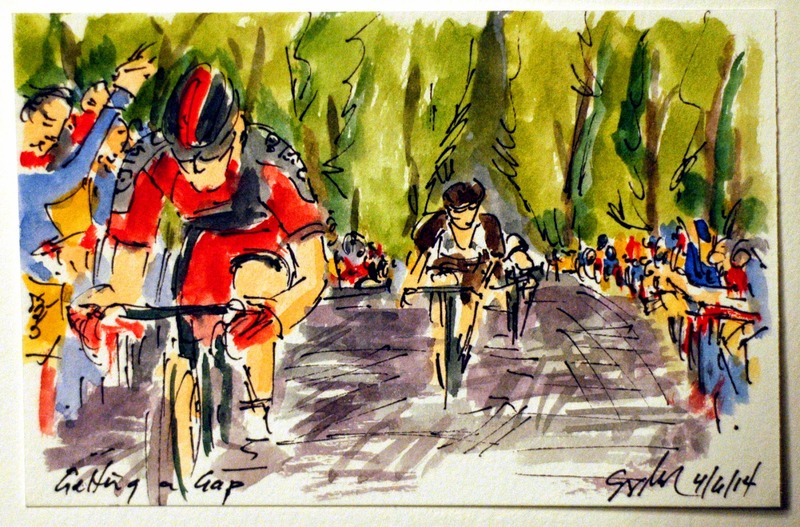 This is an original watercolor and ink postcard that was created using Yarka St. Petersburg watercolors and Steve Quiller brushes from www.richesonart.com Also, this painting and all of my cycling works, are available through my artist website at www.greigleach.com. For this particular piece you can follow the direct link at the end of this post.